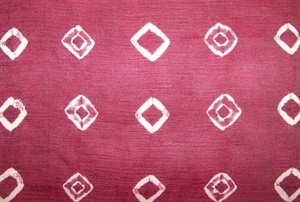 Fabrics of silk and rayon are manipulated using techniques such as shibori to create intricate patterns. They are then hand dyed using a variety of methods. Gold and black silk organza, which has been "degummed" using an arashi shibori technique to create a resist, creating a combination organza/chiffon which is then hand dyed. 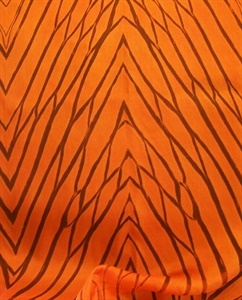 Copper and black silk organza, which was "degummed" using an arashi shibori technique to create a resist, creating a combination organza/chiffon which was then hand dyed. Hand dyed silk/linen in raspberry and charcoal. Kamisoge knot shibori technique used. 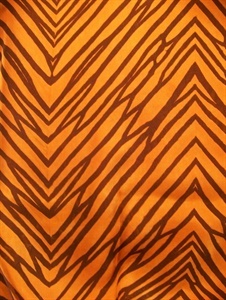 Additional piece of solid raspberry/charcoal fabric is 46"W x 23"L. Sold as set. 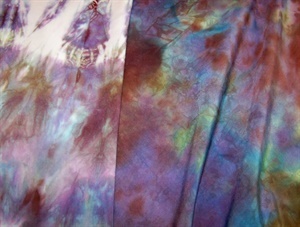 Multi-colored rayon hand dye in shades from blues/purples,earth tones with hints of green. Piece on left is 10"W x 102"L. There is an additional piece, which is 27"W x 57"L. Sold as set (3 pieces).